When an evil necromancer threatens all she loves, Ellaeva must risk her sanity to face down the darkness within her soul. ~ All the Left Hand of Death wants is something to call her own, but is the price too high? This dark epic fantasy is the second book in The Sundered Oath trilogy. Watch for part 3 to release in the fall of 2018. 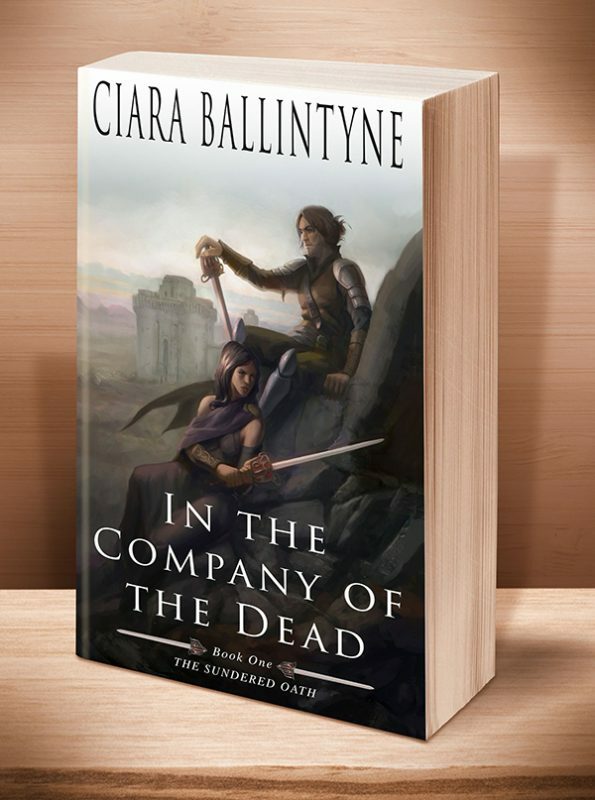 Click the BookBub button to keep informed of special deals on this book and others by Ciara Ballintyne. Just FOLLOW her on BookBub, and be sure to BOOKMARK her books as “Wanted (Deal Alert)”–that way you won’t miss out. 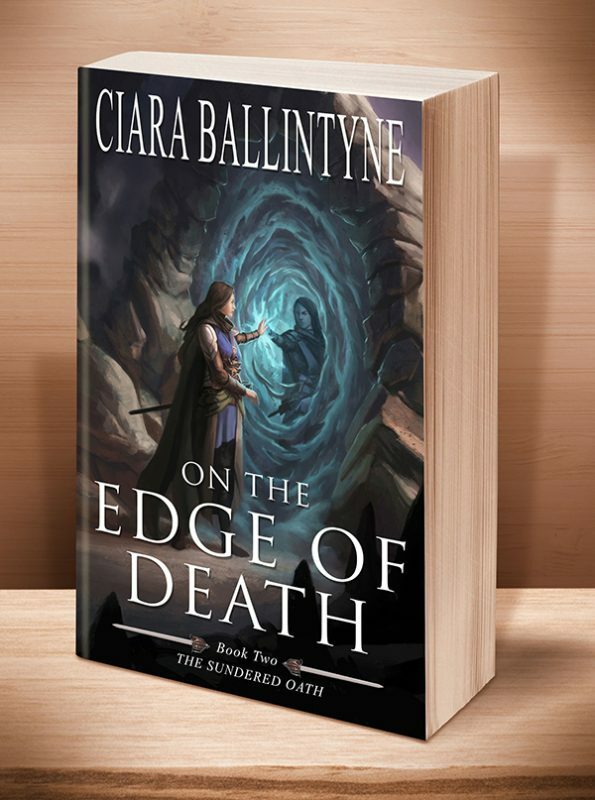 "Book Two of 'The Sundered Oath' series involves Ellaeva, avatar of the Death Goddess, in a dual quest to find her lost family and solve a murder at the same time; so readers of On the Edge of Death can anticipate this story to involve both a murder investigation and a personal quest, set against the backdrop of social struggles. The story opens with a caution and a bang as Ellaeva perceives the inherent conflict of interest between two opposing roles in her life: "A Battle Priestess of the death goddess isn’t supposed to have friends, family or lovers, and Ellaeva was learning first-hand why not." Friends and family are all threatened by Ellaeva's position - but they aren't relationships she's supposed to cultivate. Despite the power of her position, she's really in no place to ask for other favors to stay the deaths of those she has chosen to love. If giving up the sword to follow through on her investigation is a requirement, so be it. Readers will find themselves relating with Ellaeva as she makes the kinds of decisions that question her chosen paths in life and their impact on everyone around, and will discover that the action is as much based on psychological connections and influences as upon battles and murder investigations. As she faces capture, torture, death, and politics, she relentlessly probes the very facets of society that have hidden purposes from her and which have created some of the illusions which shape her world. Fans of powerful fantasy female protagonists will relish Ellaeva, who responds with sassy confrontation to challenging situations: “Does my mouse want to come out to play?” “That depends. Do you want to dance with me?” Ellaeva quick-stepped to the door, hoping to catch the Voice by surprise or get close enough to frighten her, but the other woman stood a good three feet away, her arms folded over her chest." The cat-and-mouse game operates on many levels, so fantasy readers should anticipate a level of complexity that runs the gamut from social and political observation to psychological self-inspection and physical clashes. In some ways the story offers elements of a sword-and-sorcery production, replete with battles and the feints and recoveries of swordplay. In other ways, it's at once a murder mystery and a psychological self-inspection where a priestess devoted to truth and justice faces an evil force in the world that hides under the cloak of politics and family. The story's ability to weave a tone that doesn't neatly fit into many of the predictable devices of fantasy genre writing imparts a sense of surprise to events which make twists and turns throughout as Ellaeva's seemingly-singular quest unravels the strands that connect her world. While the setting and characters created in the first book, In the Company of the Dead, will lend background depth to this sequel, it's not a requirement that the first be consulted in order for new readers to immediately immerse themselves in Ellaeva's world. Returning fans will find many engrossing expansions of themes hinted at in the opening story, while newcomers will quickly be immersed in Ellaeva's purposes and challenges and the actions surrounding her choices. Both will find this a powerful epic fantasy production worthy of reading, re-reading, and recommendation." Other Books in "The Sundered Oath"
This entry was posted	on Friday, April 7th, 2017 at 6:57 am	and is filed under . You can follow any responses to this entry through the RSS 2.0 feed. Both comments and pings are currently closed.